When you’re on the go, it’s best to be prepared for the occasion. This of course means packing light, with only the essentials, like your wallet, watch, passport, a carry-on, and a mobile card game in a box. I know what you’re thinking, how the heck can you play a card game on the go, well 2niverse Games has the answer. Ryan Leininger is a photographer, videographer, board game designer, graphic designer and owner/operator of One Wolf Creative – essentially a renaissance man for the board game golden age! Now you’re probably wondering, what is Tiny Ninjas, and to be frank, I’d rather let you read a brief overview in Ryan’s own words, because I’ll go into detail on the Table Culture episode below. 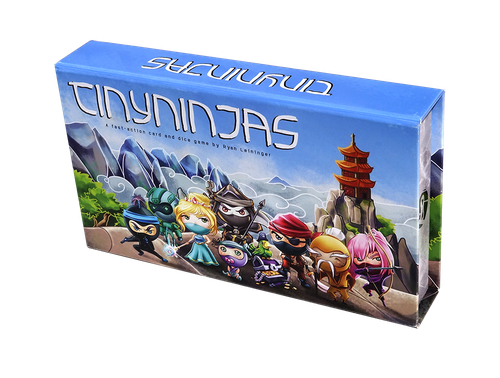 Tiny Ninjas is a two-player, dice-rolling, head to head card game that’s designed to play right inside of the box! It’s easy to learn with the perfect blend of “push-your-luck” and card management strategy, ensuring each battle is engaging and packed with excitement! Because of its size and utilizing the box as the play surface, it has an immensely small footprint making it ideal for gaming on the go. A perfect travel game! Amazingly enough, it is not just an ecologically inventive game, it’s also really good looking too. Featuring chibi style ninja art, colourful kunai and shuriken die, and some seriously inventive scorekeeping dials, Tiny Ninjas pulls you in with it’s neat theme and aesthetics, but keeps you engaged with the layered gameplay. So what are you waiting for? Check out the video, so you can get on the bandwagon and pick up this game before the June 22nd fulfillment date! Right, you want some pros and cons. Pros: The box serves as the game board, allowing you to easily travel with everything, and save on table space in those awkward moments when you don’t know where to place everything. Cons: It can be a bit challenging to differentiate some of the card mechanics text from flavour text, and colours of some die faces are similar to each other… but Ryan promises that this is being worked out for the production copies. Points of Interest: The husband and wife team of 2niverse Games is based in Sylvan Lake, and have been touring the province to share their game with the public. They actually won the People’s Choice Award at the Edmonton Prototype Convention, but I wasn’t able to see that award. I also really like that the game has little to no setup time, which you’ll see in my brief demo during the video! Let’s check it out! My final thoughts… For a mere 28 dollars, you too can have a neat travel game that actually delivers on what it offers. Fun entertainment, in a compact space. It’s a game that rewards quick decision-making and is fun for all ages. I really do hope this was a helpful review. And please let me know if you’ve bought the game and enjoyed it as much as I do. Ryan is an awesome guy and deserves all the support he can get, as this has been a 400% successful Kickstarter, and if you don’t buy-in, you’ll miss out on all the ninja fun! So please let me know what you thought of my review, like and share the video, and subscribe to the channel if you haven’t already. More theories to come in the next few days! It’s here once again… The most wonderful time of the year. Another year almost over and a new one about to begin – A new sales year that is. I see the end of November dear readers, and I get excited. Excited about the prospect of making good buying decisions that will positively impact your personal business as a creative professional, and at this stage of the game, I really don’t think you can afford not to consider Black Friday as part of your business strategy. Whether you are just getting started making and selling your form of art or well into the thick of it, there are peak sales periods where retailers are offering massive savings in order to make enough business for the fiscal year and stay afloat. I would say its a rather symbiotic relationship in fact. You get items that you’ve been putting off buying because of the expense, and businesses make enough money so that they can continue to keep the lights on for another year or two. I wrote another post about this day last year, a more in-depth overview of what Black Friday represents historically and from a cultural standpoint, but this year I wanted to spend a little time on the significance for you, and to give a timely update from my own perspective. I’ve always been tight fisted with my money. But there have been occasions here and there, where I decided against my impulse to spend money on myself. It’s the paradox of thrift, a theory of economics. The idea states that an increase in autonomous saving leads to a decrease in aggregate demand and thus a decrease in gross output which will in turn lower total saving. The paradox is, narrowly speaking, that total saving may fall because of individuals’ attempts to increase their saving, and, broadly speaking, that increase in saving may be harmful to an economy. To put it simply and rather gravely – saving for a rainy day is prudent, but penny pinching breeds a lifetime of poverty. Learning the difference between always living within your means versus always spending more than you have is a difficult lesson, but I will give you this advice, he who never takes risks is guaranteed to stay within his comfort zone. 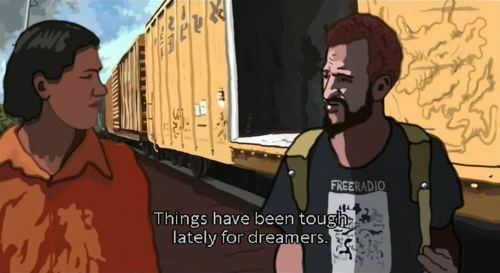 So dream big and dream often, you creative cuties. I might not be doing much tonight because I’ll be up at the crack of dawn for this sale, but I’m truly living my dreams, so I don’t sleep as much as I used to. 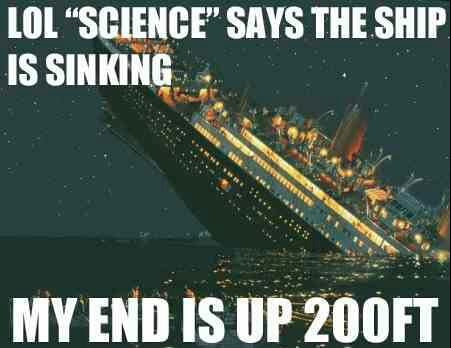 But that could just be a theory.